The current library exhibition Gusto! 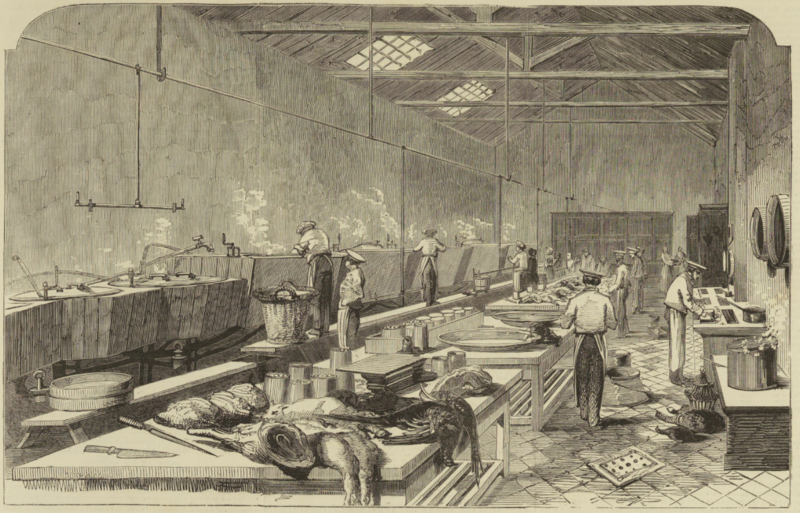 a culinary history of Victoria, explores the role food has played in Victoria’s history. One food topic that’s of great interest to many family historians is the shipboard diet – what exactly did our ancestors eat when they sailed to Australia in the 19th century? The voyage to Australia was long and monotonous, particularly in the early days of travel when a sailing ship could take up to four months to reach Australia. 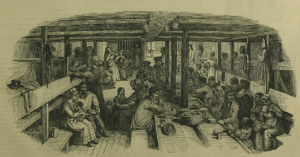 Living conditions were notoriously bad with poor sanitation, cramped quarters and rations that was not much better than what the convicts received. 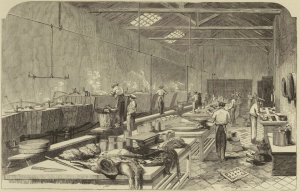 Only when the British government passed several passenger acts in the mid 19th century and set standards for sanitation, space and diet, did conditions improve. 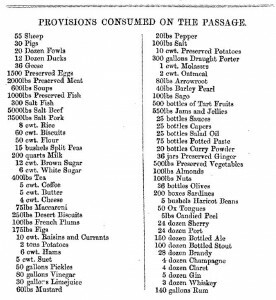 The following scale is an early example of one such regulation – a daily dietary allowance passengers who sailed from England in 1837. 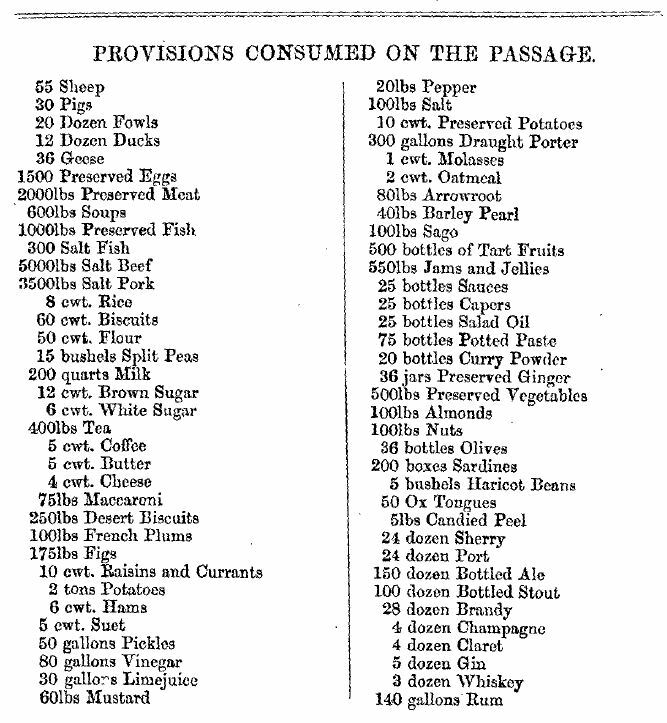 The high standard of cabin class food can be seen in a diary excerpt that appears in the book Life and death in the age of sail. Frances Thomson sailed to Australia on the Selkirkshire with her husband – the ships surgeon. In her diary she writes that they dined with the Captain each day and consumed “three or four courses to dinner every day and everything of first class quality. Today we had two kinds of soup, roast fowl, boiled fowl and sailors corned beef, mashed potatoes, carrots and turnips, cauliflower, then tarts and pudding.. almonds, raisins, nuts, figs and other things” Breakfast included “potatoes, beef steak, curried lobster, whiting and other things too numerous to mention”. (Source: p. 286). There are many other books in our collection that look at the emigrants journey to Australia. Or for a first hand account consult one of the shipboard diaries or ship newspapers that we hold. These diaries provide a fascinating insight into the day to day routine each person endured – the weather, the relationships, the gossip and of course, the food. Here are a few selections from some of the diaries in our collection. In 1838 John Sceales travelled to Australia on the True Briton On September 11 he wrote “had a nice breakfast this morning – toast eggs, and warm roast pork, quite at home this morning”. However on September 23 he reported that “the beef was really so bad that our cabin folk called for the Doctor. He came and after seeing the beef, which is the worst I ever saw.. said the beef did not appear to be wholesome”. The beef was later turned into soup! Whenever a sheep was slaughtered John would happily request the stomach so he could make haggis pudding for his family and the other Scottish passengers. (Source: p. 12 & 20). 1882 Charles Westmoreland and his family travelled to Australia on the Melpomene. Charles was appointed Mess Captain and was responsible for collecting and distributing rations to the six passengers in his `Mess’. In his diary he wrote “we have on Sundays, tin’d beef and carrots, Mondays soup and pork. Tuesdays, boiled salt beef and potatoes, Wednesdays tin’d beef and carrots or perhaps onions (preserved). Thursdays soup again with pork. Fridays tin’d beef or mutton with potatoes, Saturday’s boiled salt beef, these are for dinners, for breakfast you have coffee or tea … and bread and butter, the same for tea”. He added “I have heard some of the people grumble and say they have not sufficient meat to eat, some even have been to the Captain to complain, I think without occasion” (Source: p. 8). 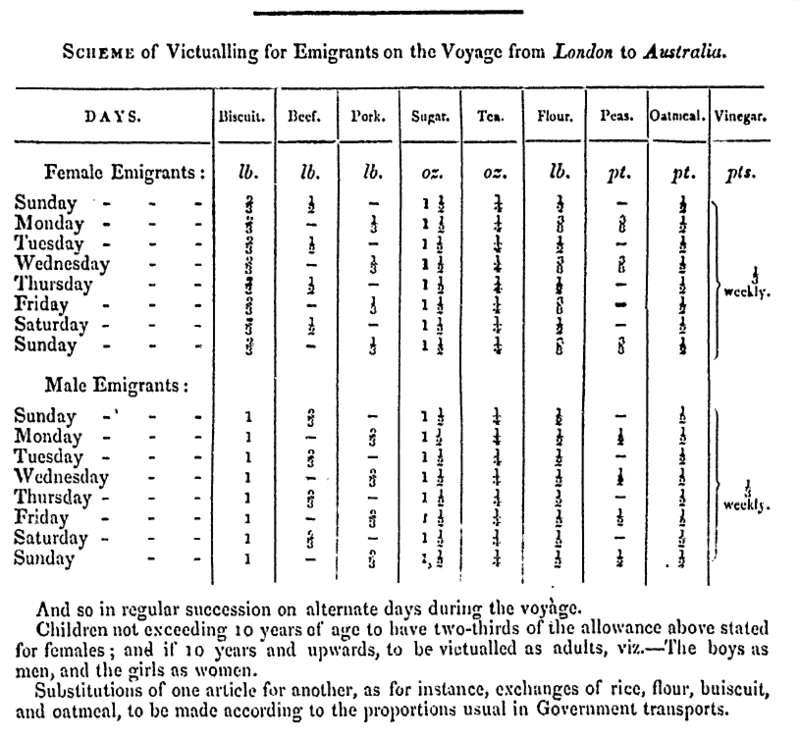 William Crellin traveled on the `Australian’ in 1882 and published a guide for intending emigrants. He recommended “To any one who may contemplate coming here, I should say, bring out some few comforts for use during the voyage, such as a ham or two, and some kind of cakes, especially gingerbread. If allowed, bring also some bottled porter or stout, and some brandy. All but the most inveterate teetotalers drink more of time latter during the voyage than they would anticipate”(Source: p. 41). Log of logs: a catalogue of logs, journals, shipboard diaries, letters, and all forms of voyage narratives, 1788 to 1988. Written by crew and passengers. Each volume lists known works and includes the name of a library or archive where you can find the work. For further information on ships please go to the Ships Information Research Guide. Richie and McCalls Preserved Meat Establishment. A major supplier of preserved foods to shipping companies. (Source: Illustrated London News, 31 January 1852, p. 93). Dear Ann – nowhere can I find a list or even suggestions as to what items our immigrant forefathers and foremothers packed within their trunks and bundles as they boarded the ships that brought them to our shores. Are you able to help, please? The ‘Outfit Required’ published in issue number 16, April 1856 can be found at: https://www.nla.gov.au/ferguson/14614278/18560400/00000016/41-48 on pages 40-41. These ‘Circulars give a variety of information for intending emigrants to Australia. 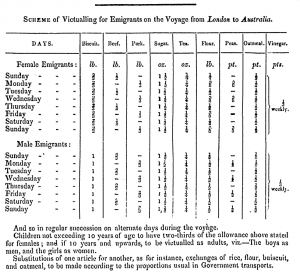 The 1856 ’Circular’ has an ‘Abstract for the 1855 ‘Passenger’s Act’ giving regulations relating to emigrant ships. The ‘Abstract’ can be read at: https://www.nla.gov.au/ferguson/14614278/18560400/00000016/41-48.pdf beginning on page 43. Information for intending emigrants was published in the ‘Immigration. Report of the Immigration Agent upon Colonial Emigration and Immigration for the year 1857’ in ‘Victorian Parliamentary Papers. Legislative Assembly. Volume 2. Number 22. 1857-8.’ (Page 35 of the Report). I found this Report in our microfilm copies of the ‘Victorian Parliamentary Papers’, however, I could not find a digitised version of it in the ‘Parliament of Victoria. Parliamentary papers Database’ at: http://www.parliament.vic.gov.au/vufind/ I will email a copy of the ‘Outfit for Emigrants’ section of the Report to you. Good luck with your on-going research.